Mia Couto, who is a journalist, reviews the television culture of Mozambique and its influence on the people who live there. 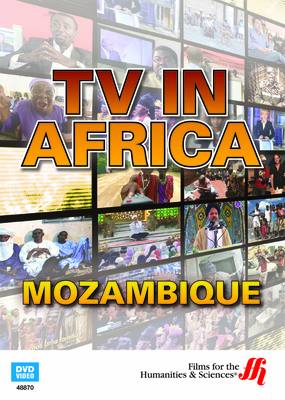 This documentary film reviews some of the shows presented on television in Mozambique that are a unique reflection of the character of the nation and the interests of television viewers there. There is also an examination of TVN, which is the Historical Channel of Mozambique, talk shows, and public service messages, especially how they deal with the subject of HIV. Brazilian Telenovelas are popular. The other popular show is “The Greatest Portuguese of All Time.” This television program covers the historical achievements of past global exploration by Portuguese adventurers. Mozambique was previously a colony of Portugal so the people speak the Portuguese language. The longest-running television program in Mozambique is the news-magazine style show called "Canal Zero." The producers of the show look for talented amateur performers and those that have an unusual position in the society of Mozambique, like the revered healers called “curandeiro.” "Historias do Bairro" covers tales about the neighborhoods and is popular with children. "For Law and Order" is a reality TV crime drama where both criminals and police tell their perspective on crimes. "Sorriso" is a sit-com about three silly police, yet the stories come from real crimes. "Full Stop" is a music show hosted by MC Roger who is a major pop star and well-known performer. "Mais Jovem" is a television program targeted towards addressing the problems of teenagers. The "Fama Show" is Mozambique’s version of the American Idol talent show.